Goshen, Newburgh, and Monroe drivers have been about the revolutionary 2017 Honda Ridgeline and its impressive mpg and powertrain specs. In addition, the innovative truck-bed, which offers a dual-action tailgate, in-bed trunk, and integrated sound system, has caught the eyes of truck enthusiasts across New York. These standout features, along with its remarkable capability, make the Ridgeline the truck to buy. The wide stance, independent suspension system, and low center of gravity of the 2017 Honda Ridgeline unite to deliver a measure of responsive handling and smooth control that is certainly uncommon within the trucking segment, and the standard 3.5L direct-injected i-VTEC V6 engine ensures that the vehicle is no slouch when you hit the gas. In fact, you’ll be able to call upon up to 280-hp, an increase of 30-hp over the previous engine. Honda fully expects the Ridgeline to make zero to 60 mph shockingly fast for a midsize pickup in its class. Unit-Body Construction: The body panels and chassis are a single molded unit, reducing weight for enhanced efficiency while improving structural rigidity. i-VTM4 AWD System: Features Intelligent Traction Management with four modes for normal, snow, mud, and sand terrain types. Front-Wheel Drive: Most traditional trucks are rear-wheel drive; the Ridgeline’s adoption of FWD allows you to enjoy better interior space – up to 109 cubic feet, as it happens. 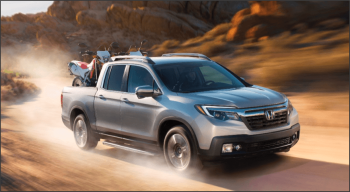 Towing: The Ridgeline might behave more like a car on the road than a conventional lumbering truck, but it is still able to tow a colossal 5,000 lbs. Payload: The Ridgeline can carry plenty as well as haul heavy. You’ll be able to load the bed up with a mighty 1,584 lbs. The Ridgeline’s innovative bed might be its most widely discussed feature around Goshen and Newburgh, but those cool new features are underpinned by a groundbreaking body and a state of the art engine. You’ll be able to haul a trailer, overtake on the highway, or tackle the backcountry without breaking a sweat. To find out more, just come down to Middletown Honda. *19 city/26 highway/22 combined mpg rating for 2WD models. 18 city/25 highway/21 combined mpg rating for AWD. Use for comparison purposes only. Based on 2017 EPA mileage ratings. Your mileage will vary depending on how you drive and maintain your vehicle, driving conditions, and other factors.